A little backstory… towards the end of last year I bought a Scamp camping trailer to finally fulfill my dream of full-time travelling the country and being a nomad. At the time, I was living in Boulder and continued staying there to live out my lease and then I got stuck in the Midwest for the winter. But I’m super thrilled as I finally took off for my grand adventure one week ago! For the past month or so before I left I worked on a project that I had dreamed of since I bought the Scamp and that I teased a bit on my Instagram. I’m so excited to share my Luna Lovegood camping trailer with you all! This girl will be travelling with me as I visit all the US National Parks and Harry Potter events, locations, and friends around the states. I initially intended to put decals of dirigible plums and the words “you’re just as sane as I am” on the outside of the Scamp. Ultimately, I decided against doing this because I figured it might be a threat to my safety to have an extremely identifiable rig that I would be towing around. Originally, the walls were an ugly wood-looking design. I felt like it brought down the mood in the Scamp and Luna would love lighter colors, so I decided to go with a light teal blue and baby pink theme. My friend Trisha and I from Simply Southern Creations brightened up the walls with white paint and went with the teal color for the cabinets. As a cute little bonus, we printed and added vinyl decal Spectrespecs to the cabinet knobs. On the bathroom door, we painted a symbol that I created that really encompasses who I am as a person and inspires me to look at. 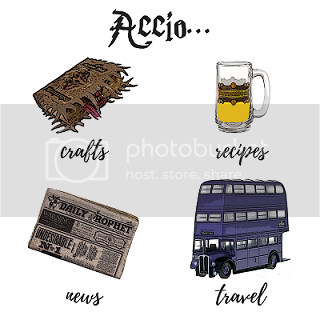 I call it my Accio Adventure symbol, named after my personal Instagram. Spectrespecs, Harry Potter book stars, a hiking boot, and some mountains are all wrapped up in a very wanderlusty symbol. Changing the curtains were the biggest chore of the Scamp revamp! The Scamp came stocked with brash, red curtains. To give them a more Luna feel, I wanted to lighten them up. I saw some Luna fabric on Spoonflower but I needed way too much to make it cost-effective to have them in the Scamp. I ended up deciding to make some from scratch. Boy, was I in for a task! I do not sew so I had no idea how to make them. After doing a bit of research, I figured out a way to make them with heat tape and a bit of hand stitching. With the added vinyl Spectrespecs, the curtains cost about $25 to make. Trisha and I painted the table white, but I’ve decided to permanently keep down the folding table in the Scamp to have it as my bed. I really enjoy eating in my hammock when I’m camping and find no reason to keep pulling it up to use as a table. I was going to change up the upholstery on the cushions, but with little time and a strict budget I decided to just throw my fuzzy gray blanket and Ravenclaw tie blanket that my sister made down over the top of the cushions. If you’re interested in following me along on my journey as I visit the US National Parks and Harry Potter events, locations, and people, be sure to check me out on Instagram! And if you want to stay up to date on the latest Wizarding World happenings, follow Simply Potter on Facebook and drop your email below.